WINDOW DISPLAY—The video wall in the admissions office at New York Institute of Technology is meant to inspire people, whether it‘s a prospective student checking out academic programs while waiting for a campus tour, or a pedestrian walking by the building who can’t help but peer inside. Prospective students can touch a video wall in the admissions office at New York Institute of Technology to learn about any academic major and watch clips of student interviews. At Georgia State University, researchers can analyze large-scale aerial photographs of Atlanta to track decades of urban flight on a video wall in the library. These are just two examples of how video walls are no longer just informational signs, but rather an integral part of teaching, research, admissions and campus communication. 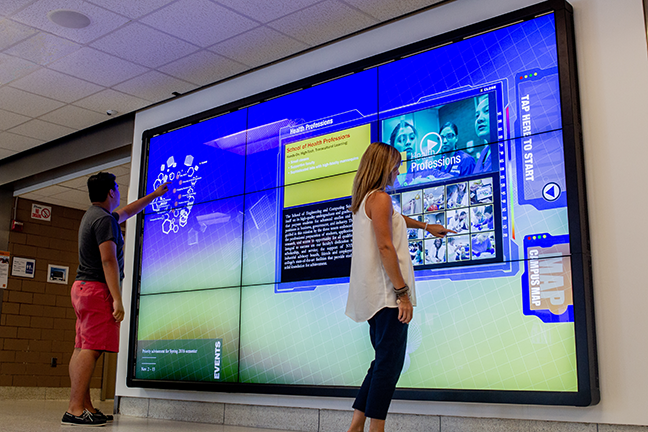 The displays also serve as a powerful tool for colleges to showcase leadership in high-tech innovation.While many colleges are experimenting with their first video walls, others are installing second-generation multiscreen displays in student unions, libraries, museums, sports facilities and academic buildings. Indiana University, for example, has 24 such displays spread across its eight campuses. Video walls were initially developed in the late 1990s, primarily for computer science projects that allowed data from clusters of computers to be projected onto a multiscreen array. Today, the potential uses of the technology seem as boundless as the imaginations of students and faculty. “By empowering the users to do whatever they think is reasonable, we are pleasantly surprised by what they have come up with,” says Eric Wernert, director of visualization and data services for University Information Technology Services at Indiana University. Last year, a student from Hungary who graduated early and returned home got to remotely participate in a special mini graduation ceremony, which was projected onto a video wall in the lobby of the main building on the campus of Indiana University East in Richmond. Wearing her cap and gown, the student watched the ceremony via a videoconference projected onto the 13-1/2-by-7-1/2 foot video wall from her home as the chancellor of the campus conferred her degree in psychology. At Georgia State, faculty teach everything from biology to art incorporating the 24-by-4-1/2-foot video wall in the lobby of the university library. An anthropology professor has used the touch-enabled display to take his class on a virtual tour of ancient Mayan ruins, while students in a human anatomy course scanned 3D images of body organs and projected them onto the wall so they could rotate and closely analyze them. Connecticut College is also using a this technology for teaching and learning. In an entertainment software design class, groups of students play video games they have projected onto a video wall in the college library, and viewers vote on the best game at the end of the semester. “I would definitely advise creative thinking beyond informational displays, and integrating the technology into classes and different events of the campus community,” says Lyndsay Bratton, assistant director for digital scholarship at the college. Before designing and purchasing a video wall, administrators must determine who will use it and what they want to do with it. Knowing at the outset whether the display should be interactive, for example, can make a big difference in cost. With 18 of its 24 video walls available to the campus community, Indiana University is trying to “democratize the technology” by removing barriers to accessing it. The university allows students, faculty and staff to log on to any of the public access video walls using their network credentials and then project anything from their computer on to it. The main purpose of the 14-by-8-foot video wall in the admissions office at NYIT’s campus in Manhattan is to engage prospective students touring the school as well as pedestrians walking by the window of the building on 61st Street. Because the display is in such a visible location, administrators set up the video wall to run content continuously. Improving classroom presentations is another reason to install a video wall. Related: Digital signage will be discussed at UB Tech 2019 session, Survey Says: 2018 College and University AV Benchmark Survey. In 2017, the University of Idaho added an 11-by-6-foot LG video display to an auditorium in its Life Sciences Building. Not only was the image resolution much higher than on the screen that faculty had previously used for projecting content, but having the wall eliminated shadows from professors standing in front of the class, says Greg Clifford, classroom technology service manager at the university. Another common location for a video wall is the library. “We are the neutral place on campus where all disciplines can come together,” says Bryan Sinclair, associate dean for public services at the University Library at George State. As a large institution, Indiana University had the internal manpower to deploy its information technology staff to design and install its many video walls across campus. That kept the cost of a typical 16-screen wall, which uses Planar displays and a Windows computer, to about $85,000, a manageable amount for the school, Wernert says. 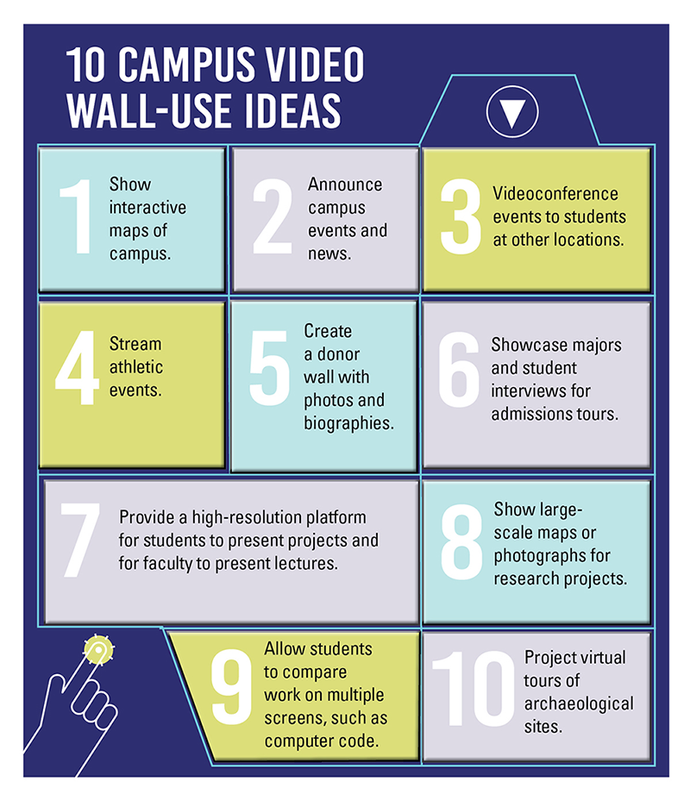 Many colleges, however, don’t have the on-staff resources to develop and mount a video wall, so they outsource design and installation. For its video wall project, NYIT hired Fred Knack Inc. of Utah to design the interactive content, and turned to Level 3 Communications of Colorado for the displays and installation. Connecticut College spent about $300,000 to purchase the computers and the processor for its video wall from Christie Digital, and a panel that allows users to control the input from Crestron. With the cost of electricity, audio and carpentry, the total price tag for its 8-by-4-foot video wall was nearly $500,000, which was covered in part by an alumna donation, Bratton says. 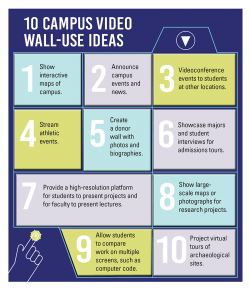 On top of the design and installation costs, colleges must devote staff time to creating and displaying content on a video wall as well as set aside funds to replace the technology once it becomes outdated—generally after five to ten years. Sherie Negrea, an Ithaca, N.Y.-based writer, is a frequent contributor to UB. Among my priorities as a university president is to ensure a campus experience that results in awareness and understanding of new ideas and diverse perspectives. I am concerned with declining public confidence in the value of higher education, in part growing from the notion that we restrain the free exchange of ideas.